WASHINGTONFor the first time since the deadly attack on the U.S. Consulate in Benghazi, congressional investigators will question high-level State Department, CIA and Pentagon officials this week regarding specific communication and intelligence about the security situation in Libya. Telegrams, intelligence reports, and classified emails from top officials at the U.S. State Department are being made available to congressional investigators in secure rooms on Capitol Hill. Sources also tell CBS News that intelligence officials will show footage from an unmanned surveillance drone that was overhead during the assault. That disclosure is likely to come on Thursday during the classified hearing before the Senate Select Intelligence Committee. On Tuesday, the Senate Foreign Relations Committee, which has oversight of the State Department, was briefed by Under Secretary Patrick Kennedy and Assistant Secretary for Diplomatic Security Eric Boswell about the deadly assault on the U.S. Consulate. While both officials have previously spoken to lawmakers about the attack, this is the first time that lawmakers will be asking questions after viewing the internal communication between diplomats and security professional in Libya and in Washington. Mike Morrell, Acting Director of the CIA, was also on Capitol Hill and met in a secure room with Senate Intelligence Committee members senators Feinstein and Saxby Chambliss. State Department spokesperson Victoria Nuland said that the documents being shared are "really specific to the requests as they come in." The State Department did screen these documents for sensitive information before choosing which items to share. Members are allowed to view the documents and take notes but cannot make copies or remove them from the secure location. The House Oversight and Government Reform Committee, the Senate Homeland Security and Government Affairs Committee and the Senate Foreign Relations Committee have all made document requests. "We have told all of these requesting committees and their staff that they can see these documents as many times as they'd like to see them, for as long as they'd like to see them," Nuland said. Nuland refuted reports that the State Department has been withholding information or limiting the viewing time. "We've really done our utmost under the Secretary's instructions to be fully compliant, transparent, and open with the Congress," she said. The most substantive session this week is likely to happen before the Senate Select Intelligence Committee. The Director of National Intelligence James Clapper, Acting CIA Director Michael Morrell, FBI Deputy Director Sean Joyce, Undersecretary of State for Management Pat Kennedy, and National Counterterrorism Center Director Matthew Olsen will all testify. The involvement of the FBI in the briefing may allow for disclosure regarding the ongoing investigation into who carried out the attack on the U.S. mission which killed four Americans. The agency has kept information private citing that there is an ongoing probe into the criminal matter. It is unclear whether State Department and intelligence officials will share additional information behind closed doors. On Tuesday, State Department spokesman Mark Toner said that he did not know the content of the briefing or the materials presented by the agency. The briefings are classified at the request of Capitol Hill. He also said that he did not know whether Secretary of State Hillary Clinton will appear on the Hill at the end of the month following a request from the House Foreign Affairs Committee. The public will largely learn the details of the assault through media accounts and original reporting. The White House and State Department say that the Accountability Review Board, the Department's own Congressionally-mandated probe, will provide a comprehensive investigation of the attack but it is not clear whether all of the probe will be made public. A source close to that investigation tells CBS News that the report could come as soon as December but that more time may be requested if needed. That probe is primarily focused on decision-making at the State Department, not the White House. A source close to the investigation tells CBS News that the ARB members have not reviewed footage from the two U.S. drones which were overhead during the assault, but they have reviewed some footage from the more than 10 security cameras taken from inside the Benghazi compound. CBS News has learned that the footage was first viewed by State Department security professionals at the beginning of October around the same time that the ARB probe began. 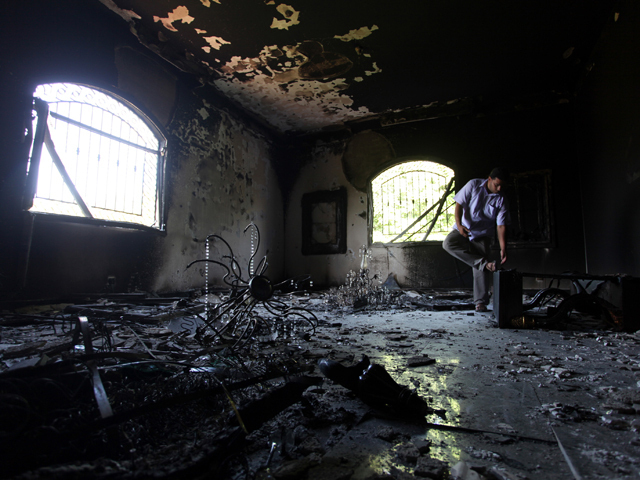 The U.S. government did not gain possession of the video until weeks after the attack. The FBI investigation is ongoing. Under Secretary Patrick Kennedy and Eric Boswell will present to the Senate Foreign Relations Committee on Tuesday and the Senate Homeland Security and Government Affairs Committee on Wednesday. Kennedy will also testify in a closed hearing before the House Permanent Select Intelligence Committee on Thursday and later that day before the Senate Select Committee on Intelligence. He will brief the Chairmen and ranking members from the House at the end of the week.